Danny Shelton entered 2016 in his second season as a defensive tackle for the Cleveland Browns, but his NFL career was in danger of never happening, as he struggled with anger issues at the University of Washington after his older brother was shot to death in 2011. Danny’s life changed in 2013 with some helping paws. 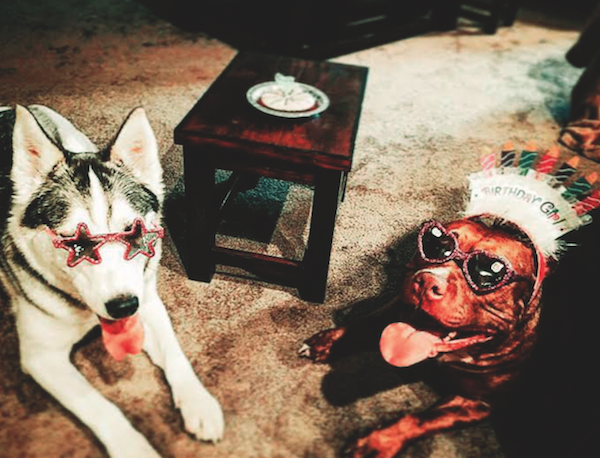 A Pit Bull named Moni and a Husky named Juicy brought much-needed stability, responsibility, and happiness into his life. “Toward the end of my freshman year, I started getting into the party scene, and it was becoming a distraction for me,” Danny said. “It wasn’t until after my sophomore season I decided to try and settle down. I got Moni. She was the runt of the litter. She would travel with me. I would tell my teachers that I had a puppy with me and that she had a schedule where she sleeps in the morning. She did really good with that. After having Moni for a year, Danny brought Juicy into his budding family. “They became part of my life, part of my family, and I really saw a big change in my production on the football field,” he said. “I was more excited, more energized. I was happier. I owe it all to my dogs and my girlfriend [Maria], and my teammates for helping me out with taking care of the dogs. I took them everywhere on campus. Everybody knew Moni and Juicy. “I saw more of a ‘dad’ side of me come out. I stopped partying and drinking. It was just me, my girlfriend, and my dogs. And now we have a third dog [Mojo, also a Husky]. Danny eventually had Moni registered as an Emotional Support Animal. Now, Danny is giving back, planning a post-football career as a veterinarian and recently getting involved with Wags 4 Warriors, which trains service dogs to assist military veterans in Ohio. 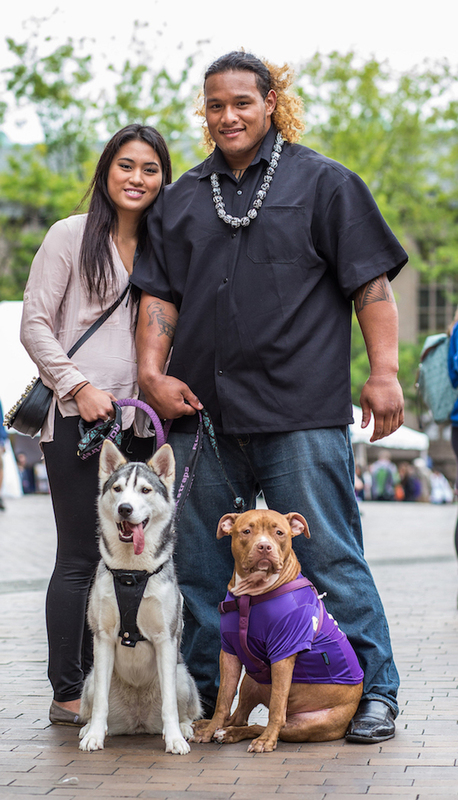 Danny Shelton and girlfriend Maria Mariano with Juicy, left, and Moni. “They love hanging out and watching Netflix together as a family. They also love wrestling in the living room after Mom (Maria, my girlfriend) cleans it up. And we love dressing them up for holidays and just for fun,” Danny said. “We love to sleep. We can sleep a whole day, and they would have a great time. We love visiting our family back in Washington and playing with their cousins and getting spoiled from their grandparents. We also love playing outside no matter what the weather is — rain, snow, or sunshine. 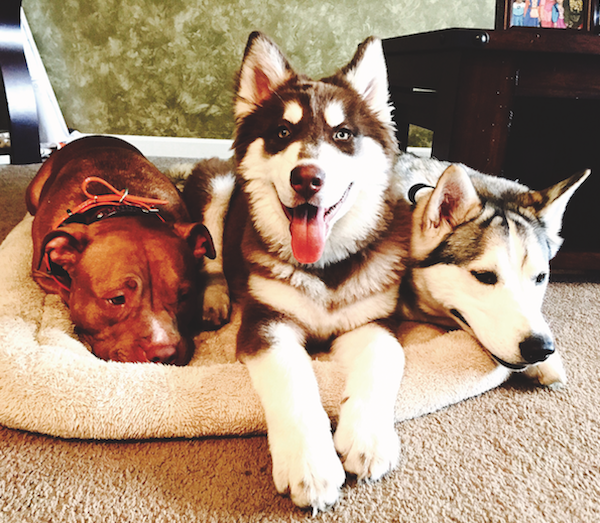 The post How Moni the Pit Bull and Juicy the Husky Changed NFL Player Danny Shelton’s Life appeared first on Dogster.